Commentary: Truly, we are through the looking glass. For the first almost 15 years of this line, you usually went to Toys R Us, Walmart, Target, Kmart, and Kay-Bee Toys for exclusives. 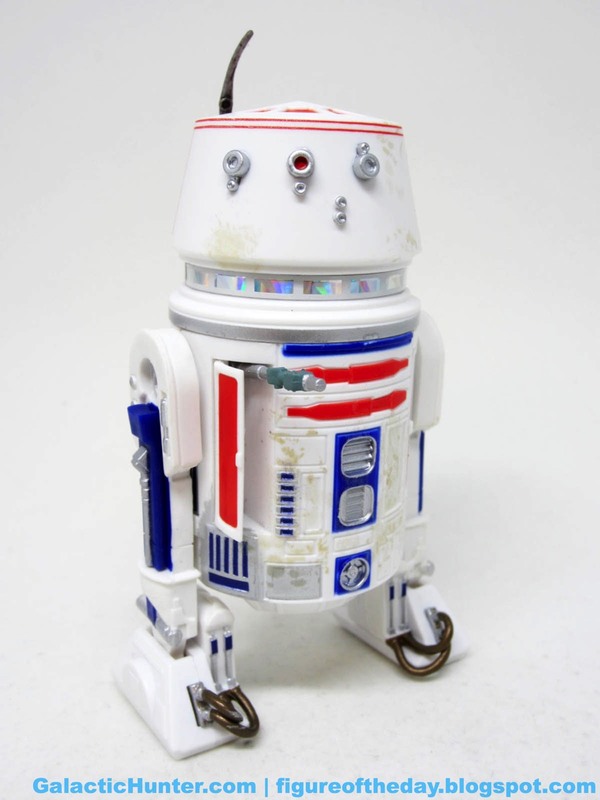 Now, GameStop and Walgreens have entered the mix for the likes of R5-D4. There's an interesting story behind this particular mold and why it originally was developed, but that might be a few years out - instead, just be happy to know it's a redeco of R5-K6 [FOTD #2,346] for now, and you can potentially get one at a game store near you. Maybe. I don't know if/when more are coming in your area. It was sold (and presold) online for $22.99, a slight premium over most figures at most other stores. And of course, it seemed to sell out immediately. I wouldn't call the paint job perfect, but they got most of the markings right on the money. 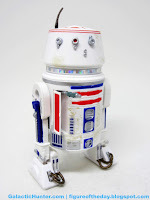 Blue markings down the middle of the body, blue legs, and a blue tramp stamp dongle all look great - they're not metallic blue, but R2-D2 wasn't super shiny either. 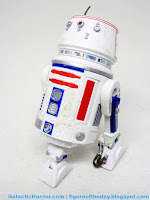 R5-D4 isn't as dirty as in the movie, but I think that's a good choice here. The dirt is visible, but light - not quite as distracting. The dome is almost clean, with lenticular markings around the neck as well as the red circles and wedges you've come to love. 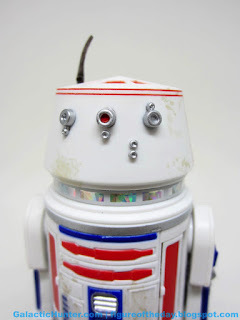 His central eye is also filled in with red - this isn't usually the case, and I'm unsure if the movie was. Most reference shows it being black, but if nothing else it's visually interesting. 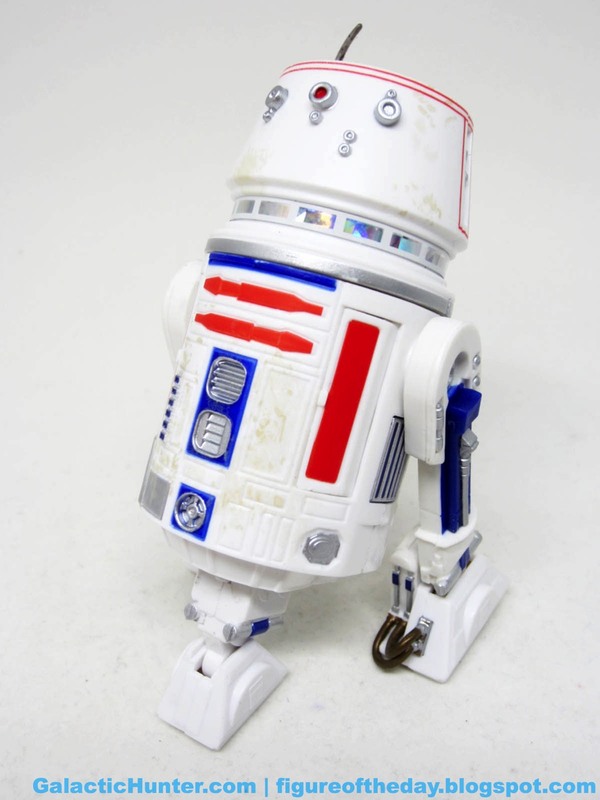 For really old fans, R5-D4 will always be the fake R2-D2 - the figure in your collection that remained perfect while the label on R2-D2 got worn down due to play. It was well-executed, and comes on a nifty cardback, but it ain't R2-D2. 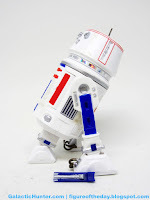 R2-D2 remains hot. Collector's Notes: I got mine from GameStop. Interestingly, the adhesive on the cardback was garbage - when I was gripping the bubble to slice it, it came right off with no tearing. Amazing. Be prepared.